"For me, it is very simple. The act of painting at a particular moment is able, for reasons I neither understands, nor even try to understand, to open up the whole world of my experience, my thinking, my aspirations." Robert Hodgins was born on 27 June 1920 in Dulwich, London. In 1938, he immigrated to South Africa, and joined the Union Defense Force in 1940. In the Second World War, he served in Kenya until 1941, then in Egypt until 1944. During the same year he returned to England and was discharged after the end of the war in 1945. From 1947-1950, Hodgins studied part-time and from 1950-53, he studied full-time at the Goldsmith's College of` Art, University of London. He first studied teaching, and then art. In 1951, he obtained an Arts and Crafts Certificate, and in 1953 a National Diploma of Design, the equivalent a major in painting. He returned to South Africa in 1954. Between 1954-62 he taught painting and drawing at the Pretoria Technical College, and from 1962-66 he worked as a journalist, art critic and then Assistant Editor of Newsweek. 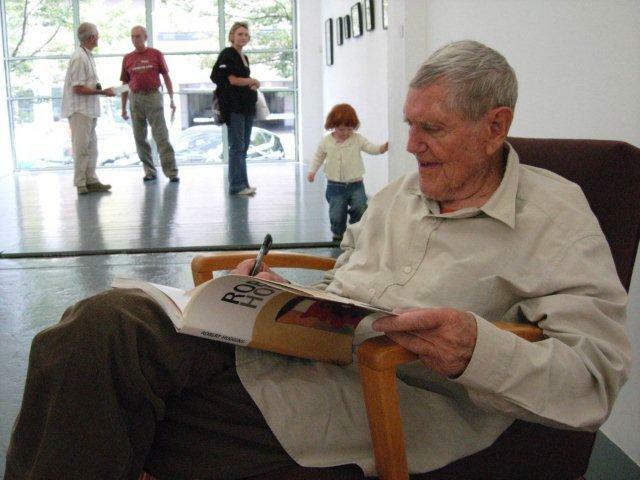 As senior lecturer he taught at the Department of Fine Art of the University of the Witwatersrand from 1966 to 1983. Thereafter he painted full-time. Despite having exhibited since the early 1950's, it was until 1981 when he was properly recognised. In the 1980’s, many artists began to develop unique styles, and made anti-apartheid or socially conscious statements. Robert Hodgins was not the exception, and began satirizing figures of power. The impact of these works was such that the Standard Bank National Arts Festival hosted a major retrospective exhibition in 1986. Robert Hodgins can be described as an expressionistic painter and graphic artist of historical events, images, figures and impressions. His icons of malevolent businessmen in pinstriped suits, prison cells, historical references and political tyrants still reappear in his recent works. He works in oil, acrylic, tempera and in various graphic media. Although the human form is the subject matter of many of his paintings, it is colour, space and placing that plays a very important role in the works. "Being an artist is about putting something into your subject matter that isn't inherently there. You are not at the mercy of your subject matter, it's the content, and what you put into it, what you do with it, what extract from it, and what you put it with, that is so exciting. If you are aware of this, then you begin to build on the content of your whole life. Before you know where you are, you're already thinking about the next work, and you could live to be 300. Paintings can be one-night stands or lifetime love-affairs - you never know until you get cracking". Hodgins has exhibited extensively in South Africa, London, France, the United States and Netherlands for over six decades.